Visitor and flight information for Trat Airport, Thailand. How to get from Trat Airport to Koh Chang, Koh Mak and Koh Kood. 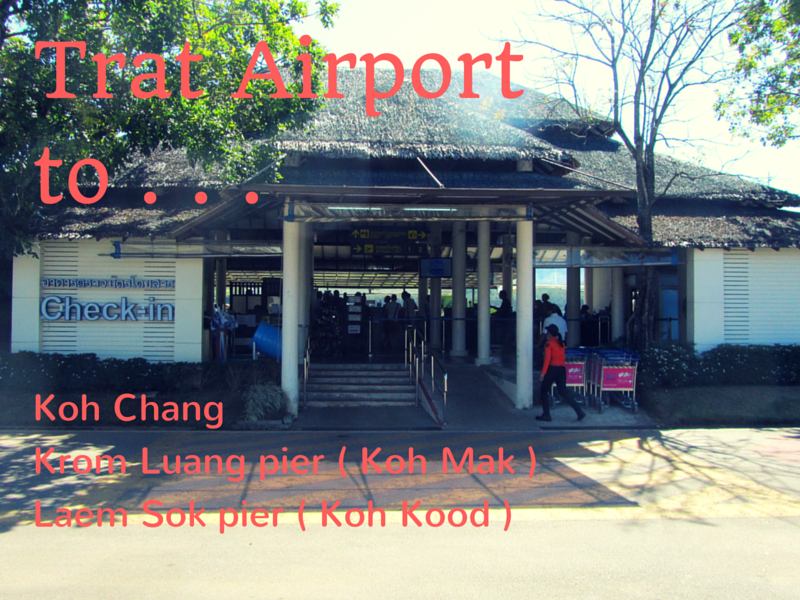 For anyone heading straight to Koh Chang, Trat airport is conveniently located approximately 20 minutes drive from Ao Thammachat ferry pier. A shared minibus service is run between the airport and resorts on the west coast of Koh Chang by ‘Krungthep Limousine’ specifically for Bangkok Airways passengers. This operates in accordance with the flight schedule. The service drops off and picks up passengers from all resorts on the west coast of the island. But unfortunately, it doesn’t run down the east coast of Koh Chang. If you are booking a return ticket, you will be given a voucher to hand the driver when he picks you up for the journey back to Trat Airport. This will also have a phone number of the minibus company, in case you decide to change hotels or flights. For flights departing from Trat, the minibus will pick passengers up around 3 and a half to 4 hours before the flight departure time. There is a 10% discount for booking the return trip in advance. Babies and Toddlers (under 2 years old) travel free if they sit on their parent’s lap. Children from 2 – 4 years old are half price. Over 4 years old are full price. Children’s car seats are not available for the shared minibus. If you are staying on the east coast of the island; are travelling in a group or family or simply prefer to to share a ride, then it is possible to arrange a private transfer by car or minivan from Trat Airport to Koh Chang for you. It will save you time, and for a family, is around the same price as booking individual tickets. Plus you’ll have a lot more space in the vehicle. The prices are per vehicle NOT per person. Prices are fixed, so everyone pays the same. Advance payment by Paypal or credit card is required for private transfers. Note that cars are usually used for transfers for two passengers. But on busy occasions a van might be substituted. If you specifically want a car, please let me know when you book. Children’s car seats ( suitable for 1 to 4 years old ) can be provided for an additional 200 Baht / seat. Koh Mak is served by speedboat services from Krom Luang pier, close to Laem Ngop village. This is around 15 minutes drive from the main pier for Koh Chang. Passengers can take either a shared minibus or a Private transfer from Trat Airport to this pier. The speedboats run several times per day during high season. The first at 10:30 and the last one being at around 17:00. During the low season, there are three or four departures per day. The last is also at 16:00. So if you are flying into Trat on PG301 or PG305 then it’s no problem getting to Koh Mak the same day. Only one way tickets can be booked as the minibus doesn’t pick up from the pier for return transfers. For online bookings, advance payment by Paypal or credit card is required for minibus tickets. The tickets will be booked for you and you just give the staff your booking reference. Note that this service only runs from Trat Airport to Laem Ngop and NOT from Laem Ngop to Trat Airport. The vehicles used are new model Toyota Commuter minibuses with seatbelts and air-conditioning. They can seat up to nine passengers, depending on the amount of luggage each person has. Private transfer to the pier. If you have a large group or prefer not to share the ride and get to the pier quickly, a private transfer can be booked in advance. Large passenger boats to Koh Kood, plus a couple of speedboat services, depart from Laem Sok pier, approximately 50Km from trat airport several times a day. The boat companies – Boonsiri Catamaran; Koh Kut Express and Koh Kood Princess all have their offices near the pier. The offices have small restaurants where passengers can get food and drink while they wait for a boat. 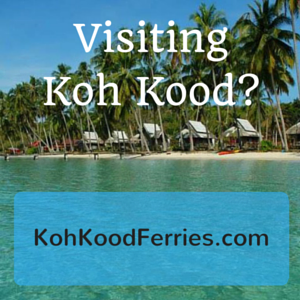 The boat tickets include transport form the pier on Koh Kood to your resort. So if you are flying into Trat on PG301 or PG305 then you’ll be able to get to Koh Kood the same day. The last boat is at 15:00. Anyone on PG305 will have to take the 14:20 Boonsiri Ferry, or Koh Kut Express Speedboat which departs at 15:00. For online bookings, advance payment by Paypal or credit card is required. The tickets will be booked for you and you just give the staff your booking reference. 4 years and over are full price. Private transfer to Laem Sok pier. You’ll see that the shared minibus is virtually the same price as a private transfer. So unless you are travelling alone a private transfer will get you to the pier quicker than and in most cases cheaper than the shared minibus. Trat is a sleepy provincial town which many people just pass through on their way elsewhere. However, it’s a pleasant stop for a night and nowadays many people spend the day there on their way to Koh kood. In the past couple of years several new value for money hotels have opened. These include Trat City Hotel, Toscana Hotel, Chivapuri Trat, Trat Centre Hotel plus long time favorites Pop Guesthouse and Rimklong Boutique Hotel. The shared minibus service from Trat Airport can drop you off at any of these hotels or other guesthouses in the town centre. Note that this is a one way service. Only from Trat Airport to Trat. Minibuses don’t pick up from hotels in Trat and go to the airport. To make a booking or request the price for a transfer, please use the form below. We will reply within 24 hours to confirm price and availability. Do you need a return transfer? Bookings cancelled under 24 Hours in advance will not be refunded. Note that if you need to reschedule a transfer or minibus tickets due to last minute flight delays etc we will do our best to make the changes for you without any additional fees or charges. We have a flight from trat to Bangkok on Saturday 17th March 18.15. We are staying at Nature Beach Resort Koh Chang. What would be the best time for us to book minivan to get us to trat airport. It depends how early you want to get to the airport. But 14:30 – 15:00 is OK for the pick up time. We (family of four) are on Koh Kood now. We need to get the airplane from Trat to Bangkok on Friday 16th at 10:00. Will you recommend to stay the last night in Trat city (?) or on Koh Chang? And do we need to be in the airport 2 ours before departure? The first public boat off Koh Kood is at 09:00. So, you will have to stay the night in Trat or take a private boat from Koh Kood to Laem Sok. Thanks for your prompt response. I think we stay in Trat somewhere- any recommendations? Also- do we need to be in the airport 2 ours before departure? Two hours before isn’t necessary. An hour will be OK. Trat City hotel, Rimklong Boutique Hotel, Chivapuri Residence, Toscana Hotel are some nice places to stay for 1,000 – 1,500 Baht / night. We(2) will arrive on sat 10 marth at 15:20 in bkk. 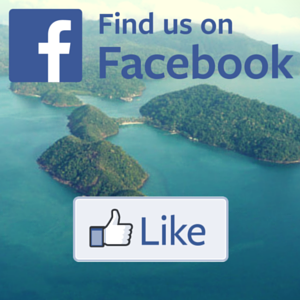 Mercure hotel at koh chang is our aim-what would you recommend that we can arrive the same day there? I don’t think you will get here the same day. There isn’t enough time go by car from Bangkok to Koh Chang. You could try to take PG307, but if your flight is late you probably won’t be able to check in on time for it. 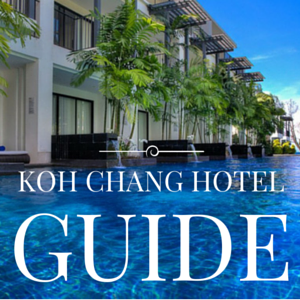 It is better to have a night at a hotel in Bangkok and next day come to Koh Chang. is there a combination possible with private car transfer to trat pier: and then a private boat to mercure hotel directly or a private boat to koh chang and then a private transport to hotel? It is possible to arrange a private boat to Koh Chang. That would be 4,000 Baht. And another vehicle to take you from the pier to Mercure Hideaway is 1,000 Baht. we will arrived to Trat 6th April at 6 pm. Can you transfer us to Goodview seafood and resort, Rural road, Dan Mai, Koh Chang the same evening? We will need transfer back to the Trat Airport on Sunday 15th April morning, because we fly at 1 pm, but we need pick up on the adress The white knot resort, Kai Bae Beach, Koh Chang. Is it possible buy a return ticket? Our plane leaves march 20 at 13.10 from Trat airport. At what time we need to pick up from Barali resort? The minibus would pick you up around 09:30. Buy tickets at your hotel. 500 Baht per person including ferry ticket. Hello, we are 4 adults and will return to Trat airport from a hotel on koh chang at November 22, 2018 to the flight TG7007, departure at 10:00 am. [ and later form Bangkok to Frankfurt, TG922). 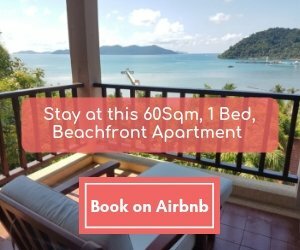 Is it possible to book a hotel on koh chang (for example KC Grande Resort & SPA) till November 22, 2018 and then chatch the flight TG7007 in time early in the morning? What is the price for private transfer and for minibus? The shared minibus will pick up from hotels on Koh Chang around 06:00 – 07:00 for flight PG302 ( TG7007) From KC grande Resort, tickets for the shared minibus are 500 Baht / person. A private transfer would be 2,500 Baht total. Is this booking form still in use? Two days ago and this morning I submitted a request but I did not receive an email/reply yet. Today we arrive with PG 307 and would like to use a shared minibus to the resort at Ko Chang. Hi. I didn’t receive any email from you, which is why I didn’t reply. But you can buy tickets when you land in Trat this evening. We are 2 adults and will arrive Trat Airport by PG0301 and go to Laem Sok pier (To Koh Kood) on 2018-4-16. Afterwards, we will leave Koh Kood to Trat Airport for PG 0306 on 2018-4-22. So may I know that the price for private transfer in round-trip? From Trat to laem Sok is 1,500 Baht total. including tax, driver and gasoline. And on 16 April, from Laem Sok to Trat Airport it is the same – 1,500 Baht total. Hi we are looking for a transfer by minibus tomorrow evening from Trat airport to ko chang, goin to klong prao beach if possible? We would like to do round trip. As it is last minute, you can buy tickets when you land in Trat. There will be seats available on the minibus as the flight isn’t full. We are 2 adult coming with the flight PG 307. arrival at Trat at about 18.00. on the monday 27. august. Last ferry is at 19.00. Do we have enough time to reach that ferry? You won’t have any problem getting to Koh Chang the same evening. Take the airport minibus service to your hotel on Koh Chang. I land in Trat on Saturday 2nd of june, 2018 from BKK with the last flight of the day (I arrive in Trat at 6pm). I wanted to organize a transfer from Trat Airport to Koh Chang for the same evening. Will I be able to catch the last ferry boat going to the island ? If yes, How can I organize with someone to pick me up ? Hi. You won’t have any problem getting to Koh Chang the same evening. Don’t worry about that. You can buy tickets for the snared minibus at the airport. Or you can book them in advance or arrange a private transfer using the form on this page. Just fill in the details and send it. we will arrive with PG 305 on November 10 at Trat airport and want to go to Koh Kood on the same day. Is this possible with the boat at 14.20 ? Would you recommend a private transfer or a shared minibus to the pier? Yes. It’s possible. If the flight is on time you won’t have any problems catching the Boonsiri Ferry. It’s better to take a private transfer, as the price will be about the same or cheaper for 2 or more passengers. And you won’t have to wait for other passengers. Hello, at what time should I request pickup from koh Chang Emerald cove to catch the flight to Bangkok leaving on 13:10 on 14th of October? Would you recommend a private car for 2 adults and a 4 year old kid? The pick up time should be 09:30 as the ferries off the island are often busy mid-morning. The shared minibus service or a private transfer will both get you to the airport without any problems. Although the private transfer will be more comfortable for you. I’m arriving in Trat airport at 23th of September in 9:30 in the morning. What time should I pick to get transfer in proper time? I would like to use a shared minibus to go to Koh Chang Klong Prao beach Ramayana hotel. Also I’m leaving at 7th of October from the hotel to Trat airport. My flight at 18:30. What time should I pick up a transfer? I hope it possible to book, isn’t it? Appreciate for the answer. On 7 October you will be picked up around 15:00 from Klong Prao Resort. Copyright © 2019 Trat Airport Guide. Powered by WordPress. Theme: Spacious by ThemeGrill.